I feel your pain in this process, I once somehow hand quilted a small pair of embroidery scissors into a quilt. I wonder if our quilts are trying to smuggle things or maybe they just like being frisked. Hmm, well, that's one place I have not checked for the 12x18 cutting mat I have misplaced! I'm taking this with me, Debby --> "If I can't be a good example, at least I can serve as a cautionary tale." I sewed a pin inside a quilt once, and caught it when it was on the longarm. You are very brave to show pictures of this event that most of us blush in secret and vow never to disclose! It was worse when I handquilted everything, but I swear I end up quilting enough of my own hair into each quilt top to make at least a small placemat. Tweezers and lint rollers generally correct the problem. 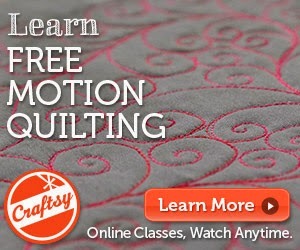 Maybe wearing a hairnet while quilting would prevent the problem in the first place! Thanks for the laugh. I needs that today. That's quite a bump you had to remove. Good you didn't try to quilt over that spot yet. That's the funniest thing I've read today. Thanks for the advice! I found a straight pin in a quilt once, so I understand about stowaways. That is good advice. I do need to frisk my quilts more often. I had just finished Quilting a quilt. While in the process of getting my finished masterpiece something bit me. Holy smokes I had to carefully pet the quilt again. Found it. It was a long corsage pin I used to pin the quilt to my leaders. How I never hit the pin while Quilting I will never know. I had heavily Quilted this masterpiece. So how can I get this out? No escape trail possible, I pulled it through up to the pearl and cut it off at the pearl. I explained to my customer that according to tradition I inserted a good luck pearl into her wedding quilt. We had a good laugh. As far as I know that "good luck" pearl is still there.